Make any light bulb smart with the iDevices Socket. Simply screw a standard bulb into this smart light adapter and you can control it from your smartphone or via voice command. With dimming and a customizable color ring, you're sure to find the right lighting for any mood. 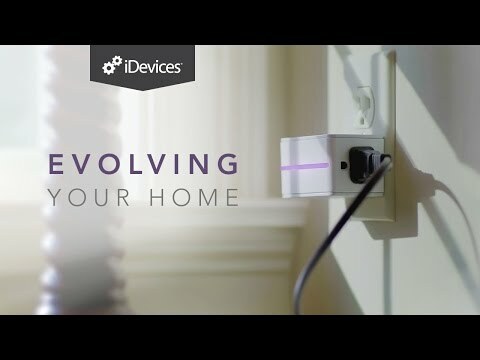 The iDevices Socket is perfect for anyone looking to get a start in the world of smart lighting. In just a few easy steps, you can turn a normal light bulb into a smart one. And best of all, there's no hub or base station required. Use the app to set up scenes and schedules and say goodbye to flipping switches. The socket can be controlled from the app or using a voice assistant. Control from anywhere: This smart light socket allows you to control your light from your smartphone using the iDevices Connected app. So if you're already in bed and still need to turn the lights out, you can do it with just the tap of a finger. Schedules and scenes: Set scenes for evening relaxation or morning wake up and integrate other iDevices products. Or set your lights to come on at the same time every evening when you come home from work. Customizable color ring: The iDevices socket includes a light ring that glows in a color of your choosing. Combined with dimming, you're sure to always find the perfect lighting for your mood. No hub necessary: All you need to use this smart light adapter is a standard light bulb and compatible smartphone - no hub or base station necessary! Voice control: Operate your light with just the sound of your voice. This smart light socket is compatible with Siri, Google Assistant, and Amazon Alexa. Screw any standard light bulb into the iDevices Socket to make your lighting system smarter. Using the iDevices Connected app, you can set up schedules and scenes to have your lighting automatically unfold with your daily routine. Or give a command to Siri, Alexa, or the Google Assistant to change the lighting with just the sound of your voice. 1. Screw the socket in and turn on the light you've connected it to. 2. Download the iDevices Connected app. 3. Inside the app, the socket will be shown at the top of the screen. Tap on it. 4. Enter the 8 digit PIN, which is included in the Quick Start Guide and written on the side of the socket. 5. After you turn the light off again, screw in a light bulb, and you're ready to go! Use this smart light adapter with a dimmable bulb to take advantage of the socket's dimming capabilities. You can further customize your lighting experience with the built-in light ring, which will add a layer of color to a simple white setup. Installation is easy as can be. Simply screw in the socket and connect it with the app. A well-built product that's sure to last. Intuitively designed app. Use the app to choose the color of the light ring, dim the light, and set schedules and scenes. Schedules and scenes, dimming, color ring, control from anywhere, voice assistant compatibility. Commands are consistently carried out with little delay. The design could be slimmer, but we were won over by the built-in color ring. A reasonable price for making any light bulb smart. However, could get expensive if you plan on upgrading your entire lighting system. Can the iDevices Socket be operated manually? Yes, there's a button on the side of the socket for turning it on and off. However, the power to the socket always needs to be on. What kind of wifi connection is required to use the iDevices Socket? You'll need a 2.4 GHz wifi connection. Unfortunately 5 GHz is not supported. Which light bulbs are compatible with the iDevices Socket? All standard light bulbs (E26 base and A19 bulb) are compatible with the Socket. If you have a Compact Flourescent Light bulb, be sure that it is labled as dimmable.